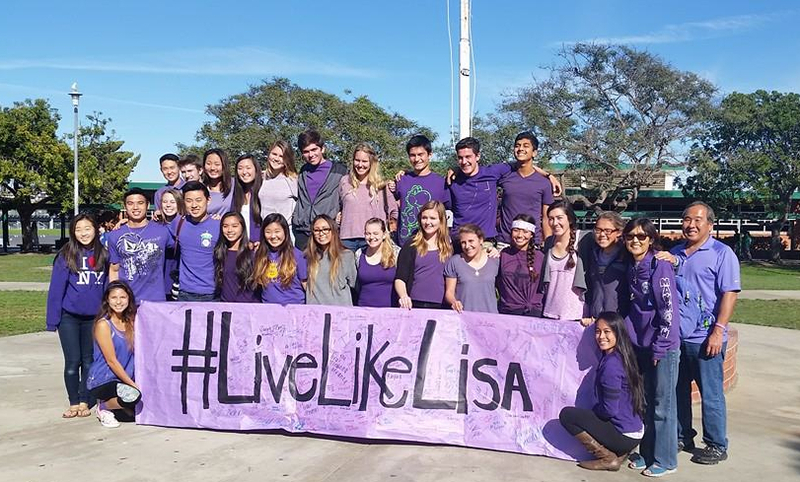 The “Live Like Lisa” team gathers on the South High School campus. TORRANCE — To celebrate what would have been Lisa Sayaka Nakamaru’s 21st birthday (Dec. 8), her friends at South High School in Torrance have launched Kindness Week in her honor. Nakamaru, daughter of Ward and Grace Nakamaru, a graduate of South High and a junior at UC Davis, died in a rafting accident on Oct. 12. Her friends and family established a scholarship in her name at South High and started an online campaign at www.gofundme.com/livelikelisa to raise funds for causes she believed in, such as animal rescue, saving the environment and being kind to people in need. As of Dec. 11, $2,900 had been raised toward the $5,000 goal. The latter event, the only one that is open to the public, will be held from 9 to 10:30 a.m. at Torrance Beach, which begins at Calle Miramar and ends at Paseo de la Playa. At UC Davis, a tree in the quad where Nakamaru’s Frisbee club practices was dedicated to her as a constant reminder of her life at the university. For those visiting the Hollywood Riviera area of Torrance to see the Christmas lights, donations for the Live Like Lisa Scholarship will be accepted by purchase of bracelets, keychains and drinks on Saturday, Dec. 20, from 4:30 to 8:30 p.m. at 5465 Sharynne Lane. For updates on efforts to preserve Nakamaru’s legacy, visit https://www.facebook.com/lisasnakamaru.